ScreenLogic2 Interface allows you to control the key functions of your pool and spa using the IntelliTouch and EasyTouch control systems, using controllers such as an iPad, iPhone, iPod touch Mobile Digital Device, Apple Watch, Android Device and PC or Mac computers, Amazon Echo, Amazon Fire TV, Amazon Echo Dot and Amazon Tap. The ScreenLogic Bundle (522104) conveniently includes the iPhone/ iPad/ iPod touch Mobile Digital Device/ Apple Watch/ Android Digital Device/ PC and Mac Interface kit (520500) and the ScreenLogic Interface Wireless Connection Kit (521964). 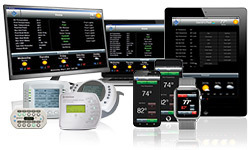 NOTE: The above ScreenLogic Interface Kits (520500 and 520502) require a 4-wire, 22-gauge wiring connection from the IntelliTouch or EasyTouch Controller Load Center COM port to the protocol adapter within the home. The ScreenLogic2 Interface Wireless Connection Kit P/N 521964) can be used to eliminate the need to run this wire where impossible or impractical to do so. Apple®, Apple Watch®, iPhone®, iPad®, iPad Touch®, and Mac ® are registered trademarks of Apple, Inc. Android® is a trademark of Google, Inc. Amazon Echo™, Amazon Fire™, Amazon Echo Dot™, Amazon Tap™ and Alexa™ are trademarks of Amazon Technologies, Inc. in the United States and/or other countries. 1: All ScreenLogic2 kits come with a protocol adapter and ScreenLogic2 PC program on CD.